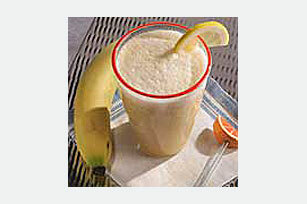 Serve this easy smoothie made with lemonade drink mix, bananas, water and ice with summer meals or for a refreshing snack. Place water, drink mix and bananas in blender container; cover. Blend 15 sec. Add ice; cover. Blend an additional 15 sec. or until thickened and smooth. To quickly clean your blender, fill it half full with hot water. Add a few drops dishwashing liquid, cover and blend for 30 seconds. Pour out the water, take apart and rinse in hot water.